An original, single venturi SV burner. The 1925 Stanley Model SV 252G (The BettyAnne) restoration is coming along well. I should get the new shackle pins and new bearings back from the machine shop early next week. Then I can begin to put the car back together. The engines are ready to come home from Pennsylvania and Calimer will finish the wheels by June. The brakes are finished and ready to install and I am shopping for tires that are supposed to be 32" x 5.77," according to the advertising literature. I am trying to figure out what the modern equivalent is. Coker is "90% sure" the right tire size is 600-22, but I need to be "100% sure!" The rims are Jaxons and measure 22" across the inside and about 70" in circumference around the inner edge. (3.14159 x 22" = 69.11498"). I am still struggling with the boiler and burner decision. 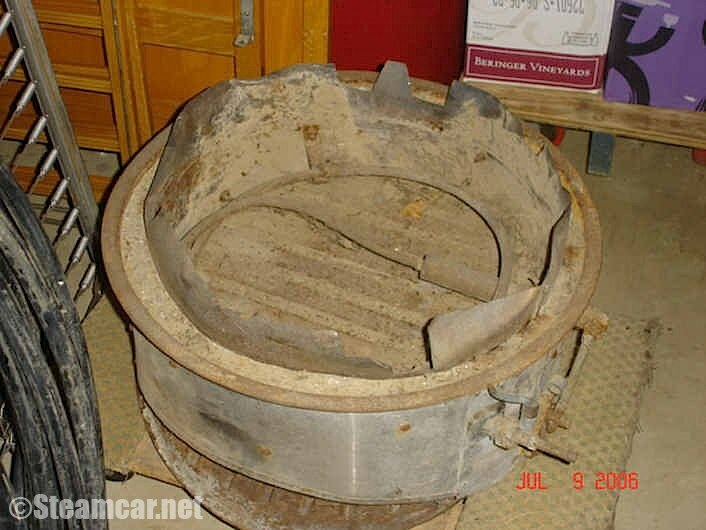 I have an original, single venturi SV burner, but it has only about 20" of fire surface, and it is cracked and repaired. Everyone who has seen it thinks it is too small to generate enough heat in a 20" boiler to do much touring. There is space for a 23" boiler, maybe 24." I could put in a conventional Stanley burner, and although that would not be original, it could always be taken out without changing the original structure of the car. On the SV, the access door to the burner is on the right side of the car. This prevents the driver from sitting in the middle of the street when starting the car. I'd love to find a Cruban burner for the car. While not original, a Cruban is certainly appropriate and would preserve the "single venturi" idea in the original SV burner. It could be mounted so that it faces the right side access door. Do you know of anyone who has a 23" or 24" Cruban burner that might be available? I spent a lot of time looking at Bob Wilhelm's web site that shows his Cruban burner. Otherwise, The BettyAnne is coming along well, if more slowly than I had hoped. While I am thinking of it, what do you know about getting axel shafts out of rear end castings? 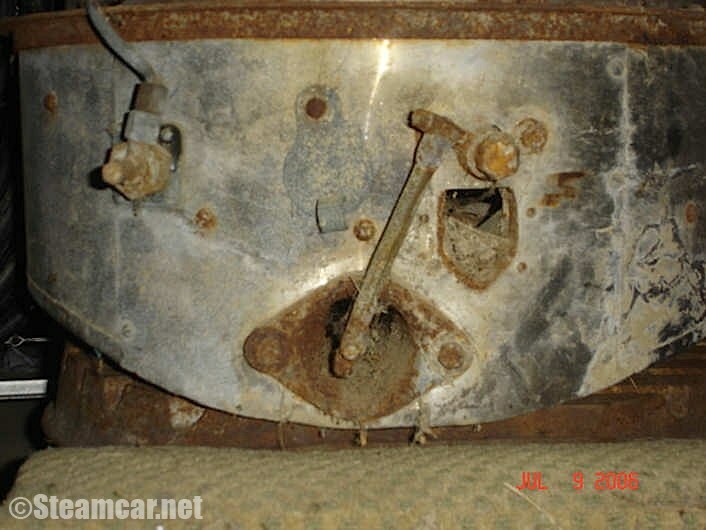 I have the rear end in two pieces and although I have removed the giant castle nut that holds the outer bearing in place, the shaft will not move towards the center of the rear end. I put the wheel nut back on and gave it a pretty good whack with a sledge hammer (cushioned with a 2x4), but it will not move. I cannot see any retaining screws to hold it in place. What is your experience with slightly earlier condensing Stanleys. I am terrified of breaking the aluminum casting on the rear end. Any advice would be helpful. This is the very last bit of disassembly. See attached photo of the right side of the rear end. The small helical at the left drives a shaft parallel to the axel that then turns 90 degrees and heads into the pump pit. 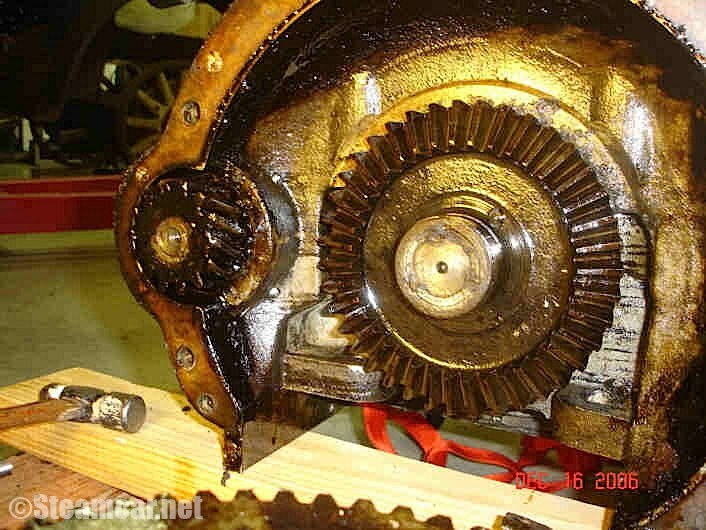 This gear was safely removed and replaced with a spur gear. I decided to change the helical gears in the engine and rear end to spur gears. It went against my instincts as a museum director, but I fully documented the changes and kept the old parts. It would have been great fun to have a completed chassis for the Delaware Steam Tour, but that is not going to happen. Don Hoke Stanley Steam Car Site. The Hoke Family Stanley Steamer Web Site.